shows continued broad based declines in the prices of existing single family homes across the United States, with 13 of the 20 metro areas showing record rates of annual decline, and 14 reporting declines in excess of 10% versus January 2008. The S&P/Case-Shiller went on to say in their report the January 2009 average home prices across the United States are at similar levels to what they were in late 2003. The good news is Charlotte and Fort Mill home price decline was in the metro group with less than 10% declines. The Southwest saw home prices fall as much as 35% in Phoenix, 32.5 % in Las Vegas, and closer to home 14.3% in Atlanta. Is the home price trend slowing? 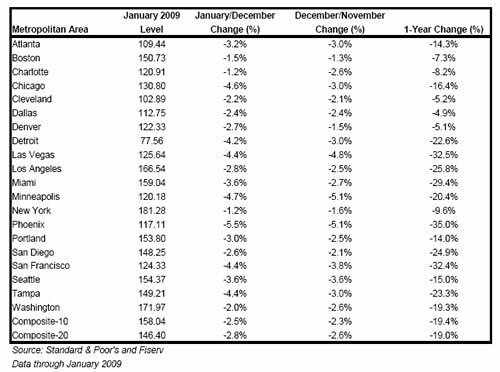 The home price decline for Charlotte and Fort Mill during the period of November 2008 to December 2008 was 2.6%. 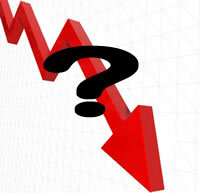 The decline from December 2008 to January 2009 was lower at 1.2%.